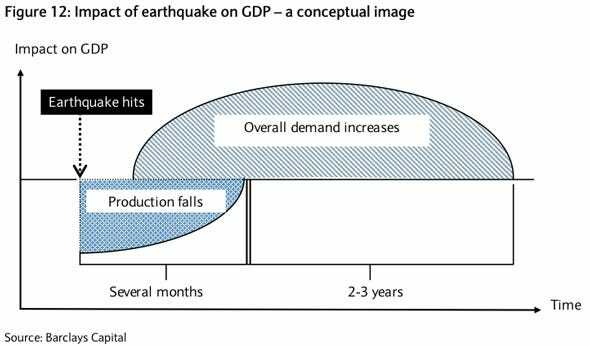 Barclays projects the total costs of the earthquake will amount to 12-17 trillion yen ($152-217 billion). With reference to the patterns following the Great Hanshin-Awaji Earthquake of 1995 and other factors, we revised our real GDP forecasts (q/q saar) as follows: Apr-Jun (to +0.8% from +3.2%), Jul-Sep (to +3.2% from +2.4%) and Oct-Dec (to +3.0% from +1.9%). In fiscal year terms, we lowered our forecast to +1.7% from +2.0% for FY 11 and left our forecast at +1.8% for FY 12. In calendar year terms, we lowered to 1.6% for CY 11 and left our forecast at 1.9% for FY 12.